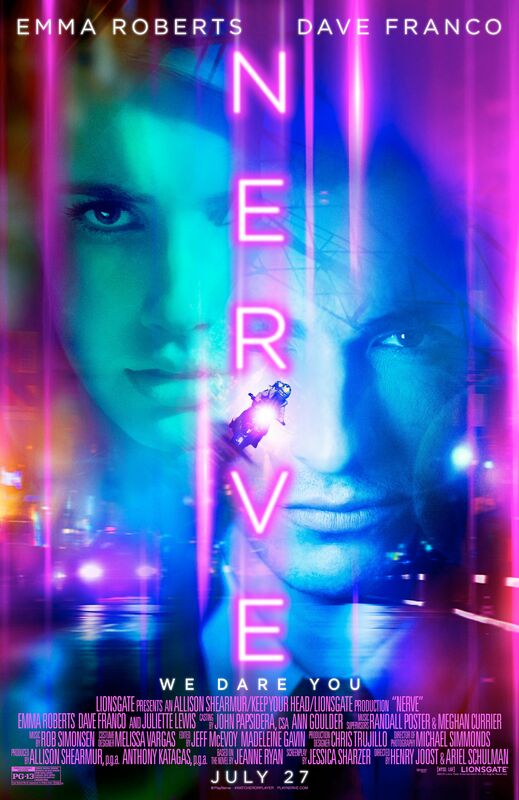 Today, we’re please to debut a poster for Henry Joost and Ariel Schulman’s new thriller, Nerve. Emma Roberts plays Vee, a high school senior who hasn’t been “living life,” so she does what anyone who’s having a late-teen life crisis might do: participate in a series of intense competition of dares for the watchers on the Web. While it starts out all fun and games — and she even becomes mildly Internet famous through her partnership with Dave Franco’s character — she soon becomes the victim of identity theft by the game-makers. Nerve has a cool premise, and Joost and Schulman, who previously directed the hit documentary Catfish, definitely understand manipulation and Internet culture. While it’s definitely a crowded summer season, I can easily see Nerve becoming a sleeper hit, especially with the younger crowd who are enveloped with online relationships. Check out the Nerve poster below. The film opens July 27th and also stars Juliette Lewis. We also got to do a brief e-mail interview with Joost and Schulman. ​We pitched her a take on it immediately – Risky Business meet The Game. How much changed from your original script to the finished film? Because of the way this film positions the relationship of Internet and user, do you see it as a companion film of sorts to Catfish? ​The internet is like a hammer, you can build a house with it or you can break someone’s face. It’s an all-purpose and all-powerful tool. To tell the story of youth and ambition today, is to tell the story of the internet. Do you think something like Nerve is close to becoming a reality? Do you think Catfishing has become easier or more difficult since your film and the TV series? But this has been happening in some form since the beginning of mankind – it’s synonomous with crushes and insecurity. What did you learn on the Paranormal Activity films that helped you direct Nerve? Here’s the official synopsis for Nerve.